Update 3/24/2014: The book is now available! Update 9/23/2013: The Safari Rough Cuts are now available. What formats will the book be available in? We will have physical paper, Kindle, ePub, and pretty much any other electronic format that is popular today. I’m a Network Admin / Engineer / Architect, will this book help me out? Absolutely. You can likely skip Part 1 of the book (intro to networking) and focus on the virtual networking deep dive and real world examples to help understand the VMware side of the equation. I’ve often preached on about the necessity of eroding silos of IT knowledge, such as a monolithic server team or network team that only handles a small subset of the overall data center. Even in the best of environments it can lead to some additional lead time to get work done – each hand-off along the way between isolated functional teams introduces latency. Today’s workforce is in dire need of men and women who can fluently talk to the four food groups: hypervisor, storage, network, and compute. And while it’s certainly easy to drone on and on about the importance of blending teams, it’s definitely much more effective to actually do something about it. To this end, I had the idea to write a book that focuses on specifically bridging the knowledge gap between those who work in the compute and server world and how their environment is influenced by architectural and engineering decisions around the network. Think of this as a “how to speak virtual networking” for those of us who manage VMware server farms. As luck would have it, I received a call from VMware Press asking if I wanted to create content and pitched my book idea – and was pretty blown away with excitement when they accepted it! This is a joint effort between myself and a good friend / colleague, Steve Pantol, who is a fellow Senior Technical Architect and all around technical ninja. We’ve spent the better part of the last two years at AHEAD tackling extremely tough virtualization and data center projects, and know all too well the challenges faced by vSphere administrators in various sized organizations. 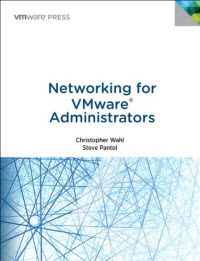 Our book “Networking for VMware Administrators” was recently added to Amazon – you can pre-order very early if you wish! The content starts with a networking primer to build a foundation for the reader (think CCNA level knowledge), then starts coupling these concepts with how a VMware virtualized data center is put together, and finally walks step-by-step through real working vSphere network configurations that meet a variety of use cases. By the end, you should be able to approach and chat with your network team using lingo they know and understand, while also being able to build out some highly available and tuned vSphere networks within a variety of hardware types, such as converged infrastructure, rackmount, NFS, iSCSI, 1GbE, and 10GbE to name a few. The content is geared towards someone who has zero experience with networking to help set a level playing field. According to Amazon, March 2014. In reality, it will probably be sooner. I did the VCP5-DCV course, but have not done the exam yet. The instructor was brilliant however, the course failed to provide the material that most of us needed. Such a big gap between the VCP5 and VCP5-DCV course. This material would really aid, to get a bigger understand, specially for those that don’t work in VMware large data centers. Gabi, VCP & VCP-DCV is EXACTLY the same cert, the name was changed because there was a need to specify to what part of the VMware stack it belongs. There is no such course for VCP5-DCV or VCP5, there is just the ICM (install configure manage) that applies for that cert (fast track also does). Looking foward for this great book Chris! You are right, my apologies, long day! Writing a couple of things and copied+pasted wrong thing. I meant to say VCAP4-DCD! Congrats on the Book. I know that you and Steve are two of the brightest when it comes to vSphere and Networking. This is sure to be a great book. I’ll need to own this one for my bookshelf. Wow – 9-months notice? Couldn’t we just get VCP & CCNA certified before March of ’14? granted, the book is needed but wouldn’t there be a better ROI on Time*Cost/Certification and be more immediate. Both are great certs to have – I say go for it! Yup, if you’ve got the time and self-motivation to get through those in that timeframe, go nuts–you might be a bit beyond the target audience for the book. That said, the book does offer a few advantages over and above basic training and cert prep. It will make an excellent coaster, for example. Congrats guys – I’m looking forward to this one! Looks like another must-have publication is born. Big congratz to both authors. -:). Have the book! Its awesome……buy it. You won’t be disappointed, and if you are, well write a better one…….I dare you!! !